Apple iPhones as we know come with very secured technicalities that make it seem very hard to explore. But there is a list of Apple iPhone codes which you can use to unveil or unlock unique features hidden inside the iPhone. This will enable users to do more and enhance their call quality among other features. If you would like to know the IMEI number of your iPhone, improve the normal settings in your device or tweak your iPhone iOS the way Android users do to their operating system. 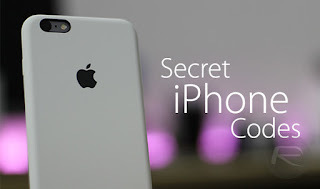 Then these codes below are secret USSD codes will work great for your Apple iPhone. FIELD TEST mode is an interesting feature which allows users to see their phone-signal strength measured in numbers, with the number going up and down depending on signal. A value above -80 is a full-bar strength, but anything below -110 is very weak. This is a more accurate way of seeing whether you have enough signal to make a call, rather than holding on to hope with one-bar. We advice you to be careful and don't tamper or do what you don't understand with the codes as using the secret codes on your iPhone is totally at your own risk.